This website is intended for Commercial Plumbing Contractors, if you are looking to purchase products for your home, please click here to go to purchase online. If you are looking to purchase commercial products here, please log in. Every year, homeowners spend millions of dollars on drain cleaner products - most of them bought from the shelves of their local stores. The family of ProClean® Drain Care Products can add a new dimension to your service operation. ProClean Drain Care Products utilize multiple strains of bacteria as their primary active ingredients. ProClean® contains natural, nontoxic, harmless bacteria that actually absorb the grease and organic buildup that forms in pipes over time and converts them into carbon dioxide and water. The biofilm that coats the inside of the pipes continues to absorb buildup. ProClean contains no harmful chemicals and is safe for the environment. It also has a refreshing scent that deodorizes as it cleans and removes the waste causing unpleasant odors. 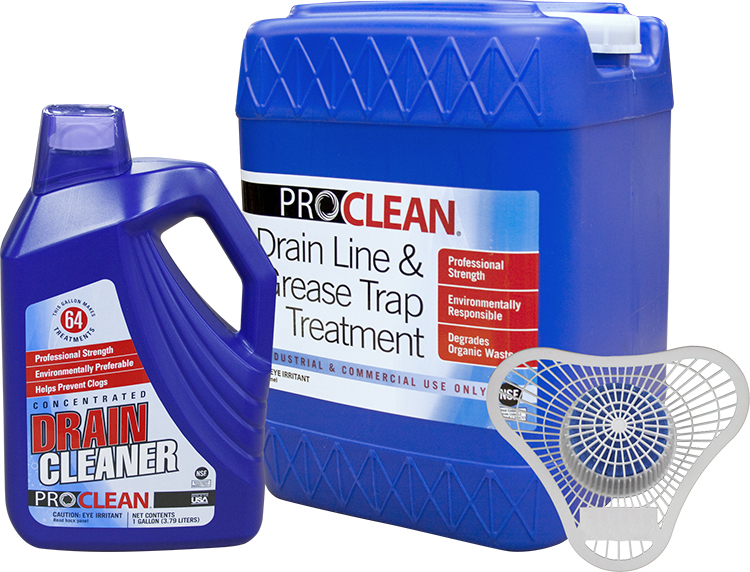 Treating your drain as directed with ProClean Concentrated Drain Cleaner will help drains stay clear longer. It's easy-to-use and economical. Over time, your drain will build up with food, grease, hair and other wastes. Eventually, the drain will flow slow or stop completely. Your drain is clogged. You call for help from a professional to clean your drain. You want to keep it that way, so try ProClean Concentrated Drain Cleaner.